American lawyer; born at Detroit, Mich., May 22, 1871; son of Kaufmann Kohler; educated at the College of the City of New York (B.S. 1890) and at Columbia Law School (M.A. 1891, and LL.B. 1893). From 1894 to 1898 he was assistant United States district attorney in New York city, and, though a Democrat, was appointed special United States district attorney by the Republican administration in 1898, a position which he held for a year. He was admitted to practise before the Supreme Court of the United States in 1902. 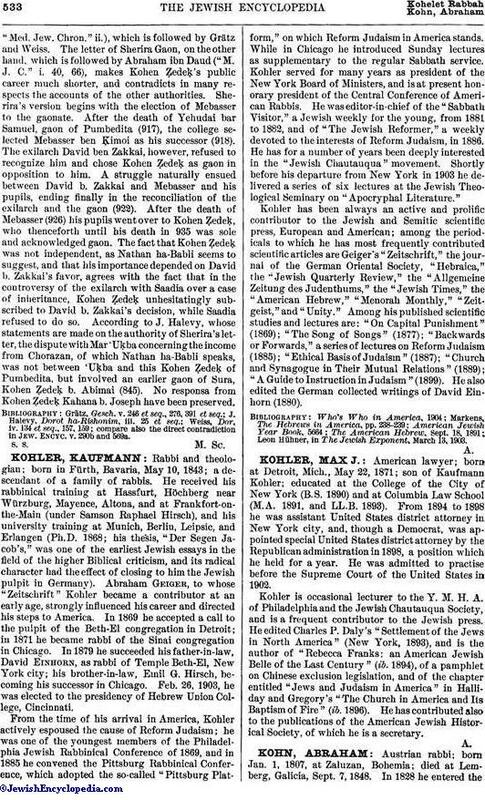 Kohler is occasional lecturer to the Y. M. H. A. of Philadelphia and the Jewish Chautauqua Society, and is a frequent contributor to the Jewish press. He edited Charles P. Daly's "Settlement of the Jews in North America" (New York, 1893), and is the author of "Rebecca Franks: an American Jewish Belle of the Last Century" (ib. 1894), of a pamphlet on Chinese exclusion legislation, and of the chapter entitled "Jews and Judaism in America" in Halliday and Gregory's "The Church in America and Its Baptism of Fire" (ib. 1896). He has contributed also to the publications of the American Jewish Historical Society, of which he is a secretary.